The Tennessee Court of Appeals is holding court in the Baskin Center at Belmont University Nashville, Tennessee, February 13, 2018. 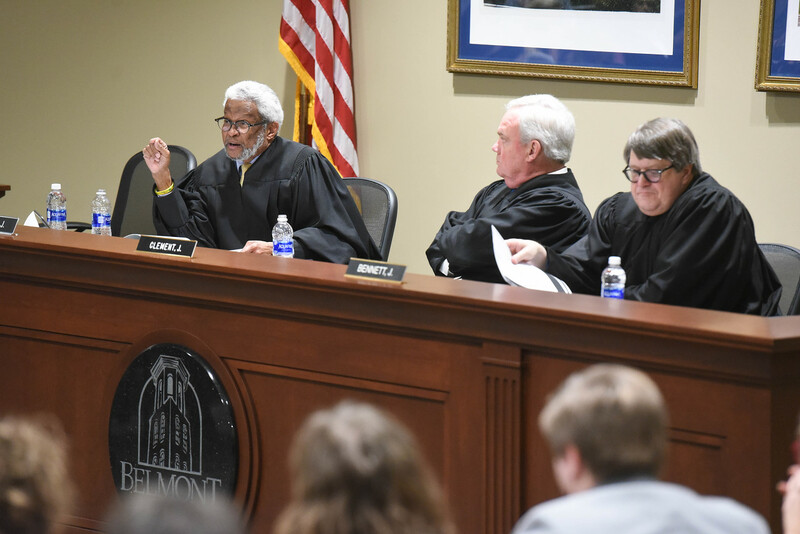 Belmont Law students witnessed first-hand how the state appellate court works as the Tennessee State Court of Appeals heard two cases in the Baskin Center Feb. 13 in front of Judges Richard Dinkins, Frank Clement, Andy Bennett and Neal McBrayer. After both cases were heard and court was adjourned, Associate Professor of Law Jeffrey Usman presented several questions to the judges in a panel format. The judges provided legal writing advice for appellate briefs, and oral argument advice. The two cases heard were SUGAR CREEK CARRIAGES v. HAT CREEK CARRIAGES, ET AL. and BETHEL UNIVERSITY v. TENNESSEE STATE BOARD OF EDUCATION ET AL.